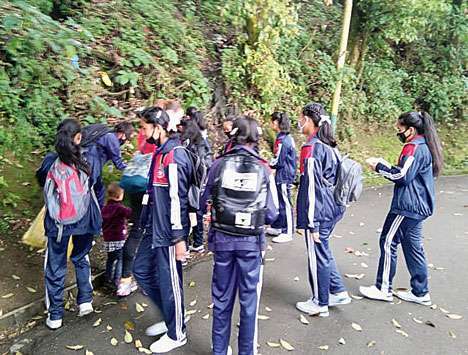 Darjeeling: Darjeeling is challenging itself to plastic freedom after a recent waste audit conducted on 200 sites across 12 Himalayan states in the country suggested that nearly 97 per cent of the trash in the hills are plastic. Integrated Mountain Initiative and Zero Waste Himalaya has given a call for a Plastic Freedom Challenge urging the hill people to refrain from using plastic from August 8, which is being billed as Zero Waste Himalayan Day, till Independence Day. The two institutions had anchored The Himalayan Cleanup initiative on May 26, 2018, across 12 hilly states during which more than 15,000 volunteers had participated. "Plastic Freedom Challenge is a collective response to the unhealthy and unsustainable life that we are leading which is evident from the results of the Himalayan Cleanup conducted on May 26, 2018. We urge people to refrain from using plastics for a week," said Praful Rao, the president of the Darjeeling Himalayan Initiative. The organisers want residents to stop using plastic bags, refrain from buying bottled water and instead carry a water bottle, stop using Styrofoamhermocol plates, cups and spoon, offer boiled and filtered water in gatherings and refuse plastic straws and cup covers. The initiative is gathering steam. "Camelia School in Darjeeling has decided to stop serving packaged food in their canteen. Many groups and organisations are taking up this challenge. The Sikkim government has started refraining use of single use plastics during government functions," said Roshan Rai of Zero Waste Himalaya. Results of the waste audit conducted from Tawang in Arunachal Pradesh to Gurudongmar Lake in North Sikkim and Chowrastha in Darjeeling had suggested that multi-layered plastics that are used to pack food packs and other commodities accounted for 62.67 percent of the waste followed by single use plastic (plastic layered paper cup, plastic polystyrene utensils), PET bottles and tetrapack which is used for juice packs and milk. The team had presented their findings before the ministry of environment and forest at Vigyan Bhawan in Delhi on June 1. The organisations has recommended a policy for mountain region so that single use plastic are stopped but the biggest challenge, however, is to phase out multi-layered plastic given than things of daily use come packed in this layer. There is no technology of recycling multi-layered plastics. Rai said that that recent studies revealed that the world had so far produced 8.3 billion metric tonnes of plastics since 1950. "In the last 10 years, more plastic was produced than the last 50 years. Of the 8.3 billion metric tonnes of plastic, 6.3 billion metric tonnes were trashed," said Rai. Darjeeling is challenging itself to plastic freedom after a recent waste audit conducted on 200 sites across 12 Himalayan states in the country suggested that nearly 97 per cent of the trash in the hills are plastic.